So how to enjoy the beauty of a caramel apple without the mess? Easy, deconstruct it. 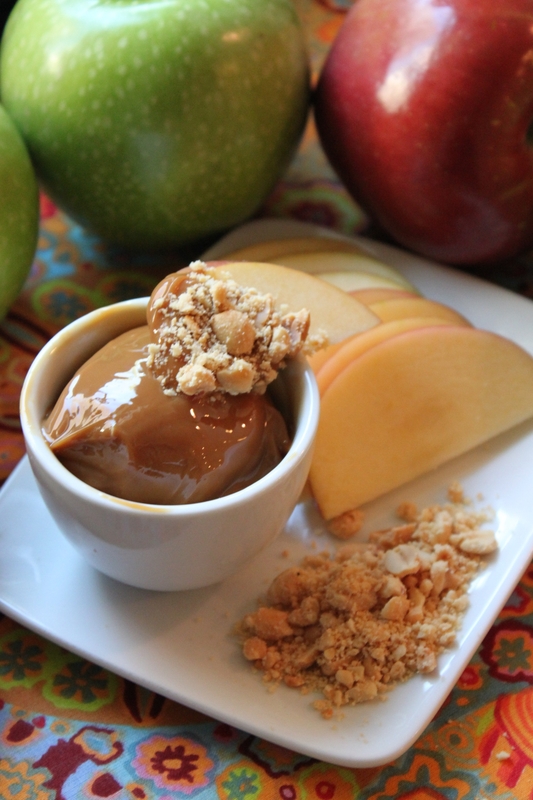 Turn a simple dessert designed for children into an adult treat of apples with dulce de leche. And because this is Living a la Mode, we will create this wonderful treat by taking something very ordinary and, with one small change, render it extraordinary. And that one something ordinary? 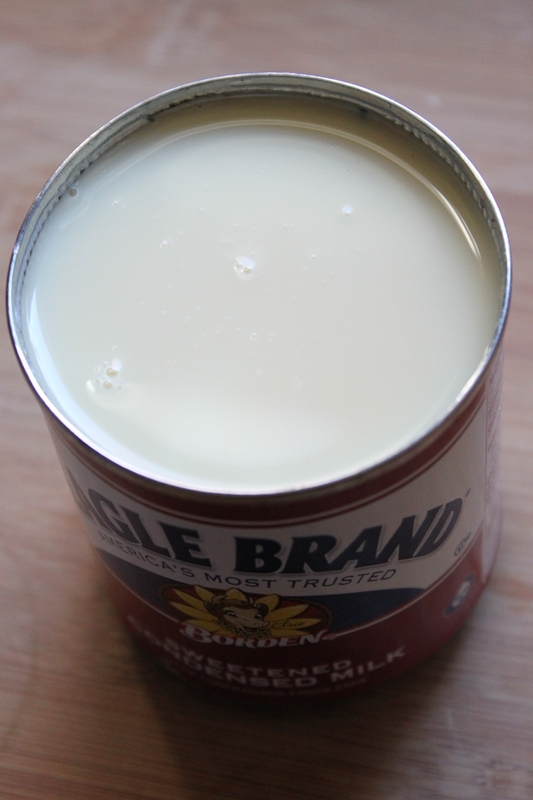 A can of sweetened condensed milk. Now how does one take a can of sweetened condensed milk and turn it into dulce de leche? Magic. Oh, and a big pot of water. Now before I let you in on this secret please allow me to state….the following is not considered the proper way to use a can of sweetened condensed milk. If you choose to proceed, remember, you are working with contents under pressure and in a way that whoever manufactured your milk would strongly disapprove of. Basically, proceed at your own risk. Funsies! Now, first remove the label from the can. Place the can in a large pot and fill with water. Make sure the water covers the can by a few inches. Bring the water to a boil. As soon as the water begins to boil lower the heat to simmer and cover the pot. Simmer for about 3 1/2 hours. Every now and then take a look to make sure the can remains covered in water. After 3 1/2 hours, remove the pot from the stove, carefully remove the can with some tongs and allow it to cool to room temperature. I usually do this in the evening before I am going to use the dulce de leche but since it is canned you can prep the milk well ahead of time. Now, here is the fun part. Open the can. I do this by turning my head and most of my body away from the can as I pierce the top with a can opener. Contents under pressure and all. Then, once the lid is cut, remove the top and ta da!!!!! And the most wonderful thing about this recipe? 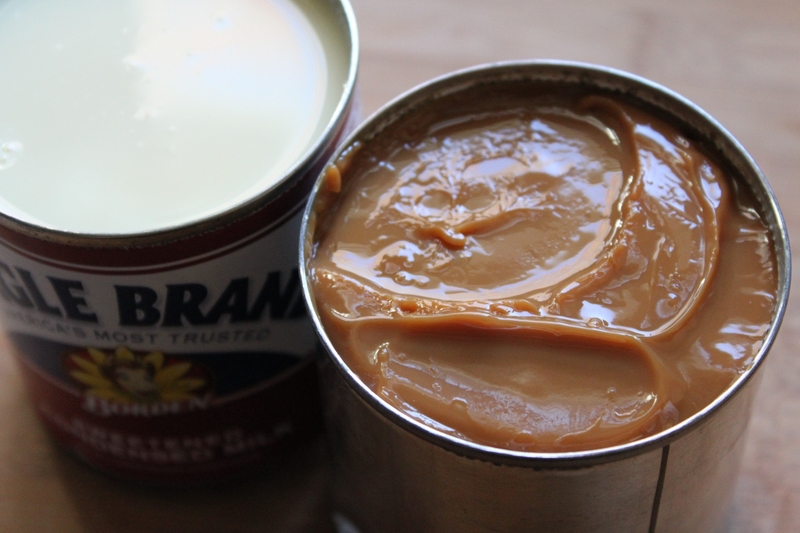 It is way cheaper to purchase a can of sweetened condensed milk than a jar of fancy, dancy dulce de leche. And as we have established so often on this blog, I have champagne taste on a beer budget. Or more appropriately, I have dulce de leche tastes on a sweetened condensed milk budget. But if you prefer not holding your breath and wondering if that can’s integrity is not compromised, go with the already made in a jar. I like living on the edge myself, at least when it comes to caramel. Next, slice up a few apples. Many recipes for caramel apples recommend Granny Smiths. The tartness of the apple is a nice balance for the sweetness of the caramel. I prefer Fuji and Gala apples myself so I say go with what you like. Finally, chop up some salted peanuts. The addition of salted peanuts is divine. 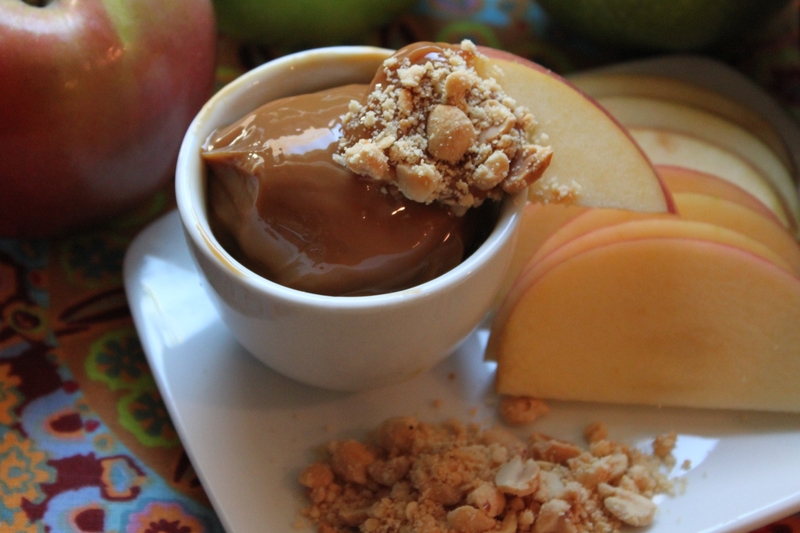 Apples, caramel, salt, peanuts….yum. I have an old coffee grinder I use to chop nuts when I need them chopped to a fine consistency. I recommend chopping the nuts fine so they cling to the caramel and not drag it off the apple. That’s it. So simple. So sweet. So a la mode. Enjoy!!!!! This is BRILLIANT! I love it! And are the pics yours? Also, love! By the way, have you discovered the deliciousness of a honeycrisp apple? Probably a little to sweet for this recipe, but a treat nonetheless. Great post! Thanks! And yes, the pics are mine. I think coming up with the photos is as much fun as coming up with the posts. If it does not say photo via pixmac/photographer than the pic is mine. I think all my photo friends have rubbed off on my. Love it! You’re doing a fantastic job! Keep ’em coming!